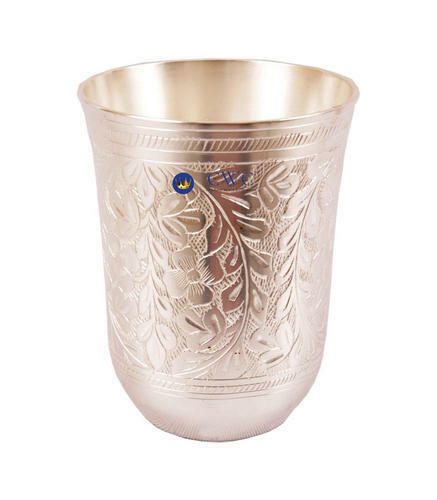 CwC Silver Plated items have antique designs. The item is highly durable, elegant and a wonderful addition to your Home Decor. It comes in a Fancy red/blue colored gift box and can be readily turned into a wonderful Anniversary, Wedding, Diwali, Valentine gift item. CARE TIPS Dusting - First, use a soft brush or clean cotton cloth to dust. Removing Candle Wax - Candle wax can be removed from a silver holder by simply running hot water over the area containing the wax. The softened wax should be easy to pry out with a finger. Never risk scratching the piece by using a knife or other sharp object. Washing and Drying - Once all dust and wax are removed, wash the item by hand with warm water and a gentle dish washing soap to remove any food but don't soak the silver in water for any length of time. Rinse the piece well with clean water, distilled is best, and dry immediately with a soft, lint-free cloth. A hair-dryer set on warm helps to dry hard-to-reach places. After your pieces are clean and completely dry, wrap each of them individually with acid-free buffered tissue, butter paper or washed cotton, linen, or polyester to store. Do not use woolor newspaper, which can cause excessive tarnishing that will be difficult to clean, or even worse can remove silver plating. Safely Display Silver Plated items in Your Home - If you'd like to display your silver plated items rather than storing it, a glass-enclosed cabinet makes a good choice. Avoid unvarnished wood shelves that can omit harmful vapors and can cause tarnishing.Glass shelves are preferred over wooden shelves.You'll have to avoid displaying or storing silver near cotton felt, wool or velvet as well. Incepted in the year 2014, Crockery Wala & Company is an eminent entity indulged in manufacturing and exporting a huge compilation of Copper Drinkware, Stainless Steel Ware, Stainless Steel Cutlery Set, Nicer Dicer Set, SS Chapati Jali and Stainless Steel Multi Purpose Grater. Manufactured making use of supreme in class material and progressive tools and technology, these are in conformism with the guidelines defined by the market. Along with this, these are tested on a set of norms prior final delivery of the order.